I found this painting online. It was first published in the National Park Service publication New Discoveries at Jamestown: Site of the First Successful English Settlement in America. The painting is artist, Sydney King’s interpretation of the lumber industry in colonial Jamestown. I find the painting fascinating as it focuses on so many aspects of woodworking. 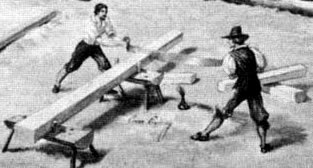 Hewing – showing a person using an adze to turn logs into square beams. Laying next to the log appears to be broad axe and a cant hook used to roll the log. Pit sawing the beams into boards. 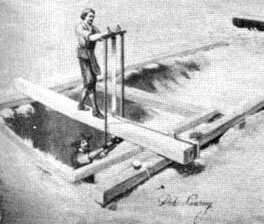 Pit Sawing – Using a large rip saw on a frame (though many were not on frames) to saw the hewn log into planks. Notice the large brimmed hat on the pitt-man, likely to help him avoid the sawdust. Crosscutting Timber – Using a two-man crosscut saw (also called a whip saw). The wood was secured on saw horses and cut to length. Riving wood into planks using a froe and club. Riving – Straight grained wood (abundant in the old growth forests) could be rived with a froe and club and literally split into planks. Portable grindstone could be wheeled to where it was needed. Grinding – The bladed tools at use would need to be re-sharpened. This particular grindstone was made to be portable, so time would not be wasted running back and forth when sharpening an axe, adze or froe. Woodshop – It makes sense that the woodshop would be kept as close as possible to the lumber mill (though it may just have been done by the artist to show where wood might have been headed. 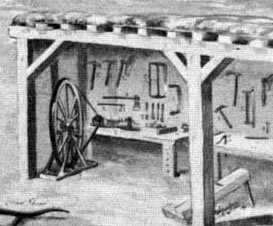 This shop seems to contain a great wheel lathe, hatchets, a drawknife, frame saw, several adzes, planes, chisels, and a what I believe is a large jointer sitting on the floor just behind the post on the right. 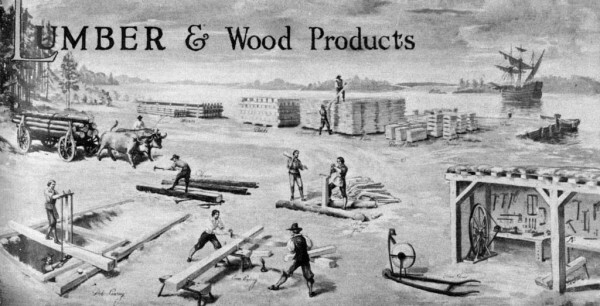 A fun little glimpse at early American woodworking history. I saw a demonstration of a typical lumber manufacturing operation form the 18th century once. It had the big frame (actually situated over a pit)for ripping logs into planks with a guy on top and one on bottom pushing and pulling on a big rip saw. It was interesting to see. I can’t say that I would have wanted to be with them. I love hand tools, but, I don’t think I want to do that task by hand. I agree Doc, I would not want to be the pitman or the man at the tiller for more than a couple of boards. Doesn’t sound like a fun arrangement. Hard to believe it was somebody not involved with sawing that came up with the idea for the rotary sawmill and not some pitman that was looking for a better way.